Percentage Breakdown of a Deer: What Weighs What? I fully realize I'm "odd" when it comes to these types of things but... I've always wondered, "How much of a deer's weight consist of hide, bone, head, meat, guts...?" Stated another way, "How much real meat do you get from a deer?". I recently commented to some friends on the amount of lean, trimmed, deboned meat I packed in the freezer from a small, Southeast Texas deer and asked for their input. One of them shared the following numbers from a 7 point buck he killed near Mason, TX some time back. I found this interesting so I thought I'd share. Obviously, your mileage will vary depending on lots of factors (poor knife skills, fat deer who really needed to pee, ...) so these should be considered general, "rules of thumb". My percentages were not as high as found below but the certain individual (whose name rhymes with Mon Dartin) who weighed each of these components will pick a carcass cleaner than a pack of hungry fire ants in August. Ribs are broken out separately since not everyone takes them. The live weight the deer is probably a bit higher since it does not include the weight of the blood. Weight of ticks IS included below in the hide category. If you've done a similar calculations on other game animals or on deer from other parts of the country, please share in the comments sections below. At some point, I plan to weight each and every component since now I'm curious as to how much a deer's head weighs, just by itself. Below is a picture I snapped after a successful outing this past Saturday. 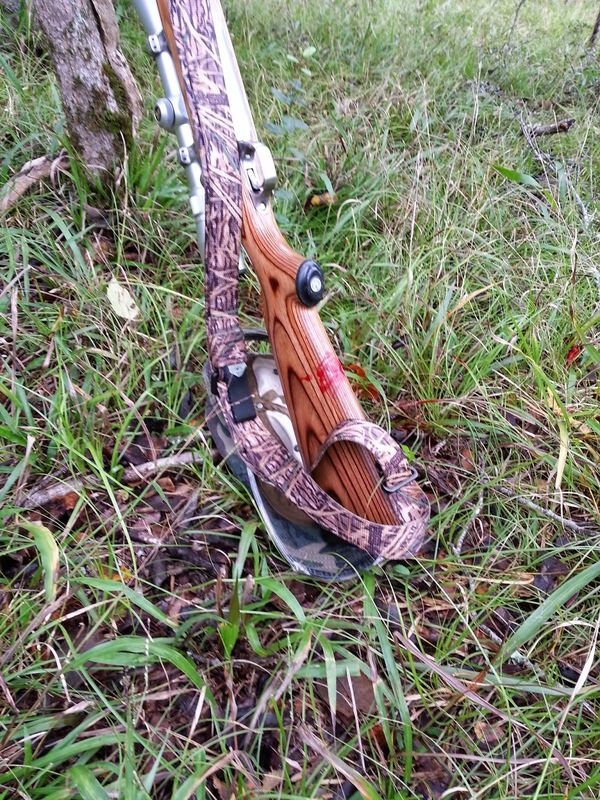 It is a photo of my favorite rifle with blood on the stock, leaning against a tree. (e) absentmindedly threw a piece of bloody trachea away from the carcass and hit the ONLY object within 900 square acres I would have preferred to NOT get bloody.